Aboriginal and Torres Strait Islander people are advised that these pages contain images and names of deceased people as well as links to pages containing such material. South Australian Alfred Cameron arrived at Gallipoli towards the end of the campaign - on 13 November 1915, leaving 30 days later. He also served on the Western Front and in Egypt but suffered from a variety of medical conditions. After the war he worked mainly back in the Meningie district of South Australia. He died at the age of 57. ● See also: Black Digger: a challenge for Australia's reverence for a white Anzac legend by Paul Daley, The Guardian, 5 Dec 2014. Larry (Lawrence) Farmer enlisted in 1915 and fought at Gallipoli. However, he died on the Western Front the following year, shortly after the commencement of the Battle of Pozieres. He was one of four Aboriginal brothers who managed to sign up to fight in the war. ● See also the entry in They Served with Honour [5MB pdf file, opens at page 12]. Lewis Farmer, older brother to Larry (previous item), enlisted in 1914. He fought at Gallipoli, then at the Western Front where he was injured in the Battle of Pozieres. He survived the war. ● See also the entry in They Served with Honour [5MB pdf file, opens at page 14]. Alfred John Hearps was born in 1895 at Forth in northern Tasmania. He had an Aboriginal father. He fought at Gallipoli and later on the Western Front where he was promoted to second lieutenant alhtough he was killed soon afterwards, aged 21. ● The entry is followed by suggested classroom activities and discussion questions. ● A large image (abc.net.au) is available. ● See also Ben Murray on our Biographies page. (If you have difficulty scrolling down, use the scroll bar itself.) Western Australian Gordon Naley landed at Gallipoli on 25 April 1915. He was soon evacuated with typhoid then later fought in France. He married a baker's daughter in London after the war, then he returned to Australia where he took up a soldier-settler land grant in South Australia (an unusual opportunity for an Aboriginal person). ● For more information, see Gordon Charles Maley on our Biographies page. ● See also the entry in They Served with Honour [5MB pdf file, opens at page 30]. William Westbury was a South Australian who had served in the Boer War and was promoted to Corporal three days after landing at Gallipoli on 25 April 1915. He was evacuated after being shot in the ankle in May but returned to duty at Gallipoli at the end of June. Note also the historical context which begins on page 38 [pdf file, 5MB]. More information (dlgsc.wa.gov.au) about the publication is available. 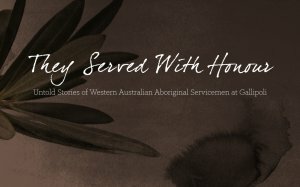 A news item about the above booklet They Served with Honour on the thirteen Aboriginal soldiers from Western Australia who served at Gallipoli. HOW MANY Aboriginals were at Gallipoli?